_MAL1073.jpg, originally uploaded by Michael A. Lowry. This morning at 9 o’clock — no, make that 3 P.M. — I hooked up with Anna for a bit of climbing at Ekoberget just outside of town. It was my first time there, and I made the mistake of thinking I could find my way based soley on one glance at the map. This was not the case. Suffice it to say that the route there is somewhat circuitous. After a bit of driving around, we finally found the way there and even managed to get in a bit of climbing. I did my first outdoor lead-climb, and was happy to make it to the top without falling. I'll practice falling while leading some other day, and probably indoors. Today was also the first time for me to use the some new goodies I brought from the ’States. 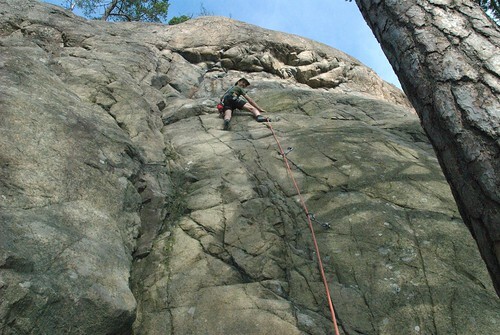 The rope, quick-draws, and carabiners got their first taste of rock today, and seemed to work well. It was warm and sunny when we arrived, but the clouds began to move in after about an hour or so, shortly after Matt & Lisa joined us at the cliff. We had intermittent sunshine the rest of the time there. Anna didn't get in a lead-climb this time around, but there's always next time. She did get some nice photos of me though. Thanks, Anna! The day was documented in 13 photos.